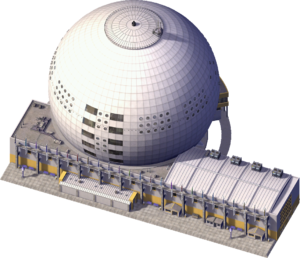 The Globe Arena is a downloadable Landmark Building for SimCity 4 Rush Hour/Deluxe, released as the Plugin Pack 006 free Downloadable Content. It is a recreation of the Globe Arena, known as the Ericsson Globe since 2008, in Stockholm, Sweden, completed in 1989, as it appeared in 2003. The News Ticker fluff entry created on its placement is "Globe Arena Rolls Into #city#". This page was last modified on 6 February 2014, at 00:15.